The smallest languages are difficult to see in the full word cloud, so we have created a second one, below, which includes the languages with less than 10,000 mother tongue speakers. The largest in this group is Turkish, with 7,860. For perspective, you can compare the size of “Turkish” in this cloud to its size in the full cloud, where it sits just above the second “a” in “Tagalog”. Even when zooming in on the second cloud, the smallest languages are still difficult to see. Those with 1000 or fewer mother tongue speakers in Toronto are: Danish (715), Lao (695), Swedish (690), Norwegian (265), Ojibway (230), Flemish (150), Cree (105), Inuktitut (15), Mi’kmaq (10) and Dene (5). 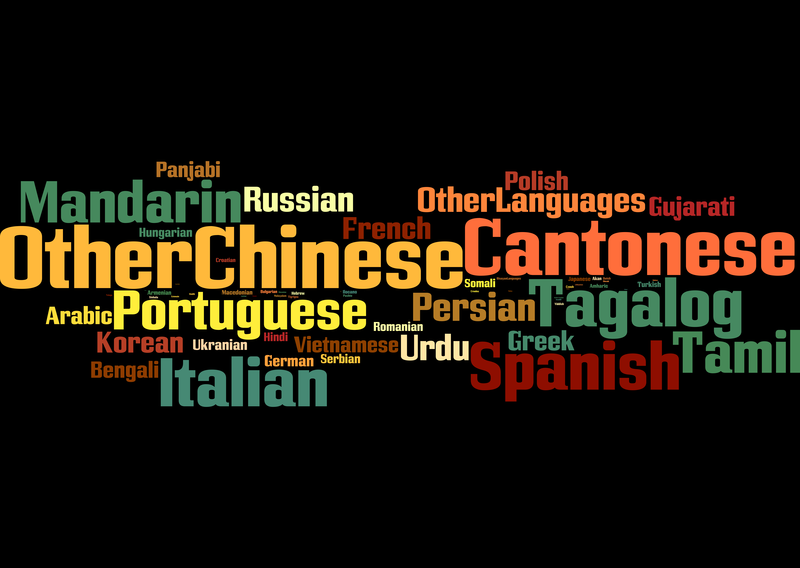 Given that many of our city’s small minority languages do not appear in the census data at all, we are left to wonder: How many endangered mother tongues are spoken here?